See our Prices page for prices, part numbers, and ordering information. Please contact us for availability. SiedarcTM sparking electrodes perform the function of exit terminals for charge dissipation into the water. 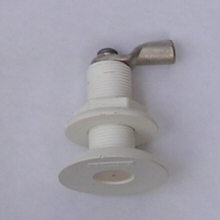 Designed to the same specification as a lightning air terminal, each is embedded in a Marelon fitting requiring only one through-hull penetration, preferably just above the waterline. Providing exit terminals around the perimeter of the hull is the key to an effective system design since it enables the lightning down conductors to be routed externally to all wiring and conducting fittings. The illustration on the left shows a layout with six Siedarc electrodes and two HStrips providing exit terminals from an external network of conductors. The port view is the same. That is, there are six electrodes, and two HStrips. This layout embodies the ExoTerminalTM lightning protection system. While the recommended number of electrodes for the typical boat is 6, as shown above, a smaller number may be adequate in salt water. For general information on placement of lightning conductors and grounding terminals, see the Grounding Guide. For a more technical discussion of the physical concepts see Grounding Concepts. Each SiedarcTM is installed through the hull usually just above the waterline. 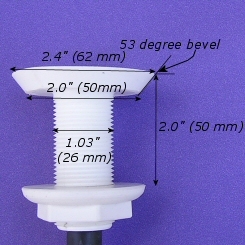 A single 1.05" hole is all that is required for the mushroom-head fitting (see below) that is then inserted and fastened by means of the GRP nut inside. 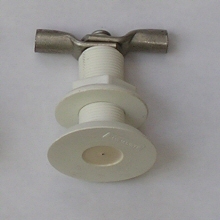 The flush-head fittings require a beveled hole as shown below. For a new build or sandwich hull requiring an epoxy plug, we can supply a metal template (FlushPlug) for forming the correct hole shape. NOTE: We are changing our line of electrodes from tinned copper to silicon bronze and are still developing the information web page and pricing. 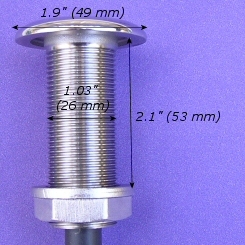 These will be available in Marelon through-hulls, but not stainless, and have similar connection capabablities to those described below. SiedarcTM electrodes are available with four types of connection as summarized below. Daisy chain In-line through connection to immersed grounding terminal. ECon Crimp-it-yourself economical lug-type connector. Highest quality connection for perpendicular cable run. Highly recommended for exposed locations. Cable in 4' & 8' lengths. Highest quality connection for parallel cable run. Highly recommended for low clearance applications. 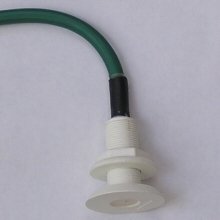 The daisy chain connection is intended to be used whenever a cable run passes by a SiedarcTM electrode with an ultimate termination on an immersed terminal such as a HStripTM, or keelbolt. In The EHLoopTM, as shown in the diagram above, both the daisy-chain SiedarcTM electrode and an HStripTM are connected into a continuous loop that also includes the mast base and chainplates. 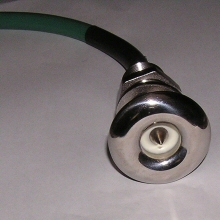 The EConTM connection comprises a heavy-duty lug that has been rounded off and tinned to minimize sideflash risk from the connection. All connecting surfaces far exceed the cross sectional area of the cable. 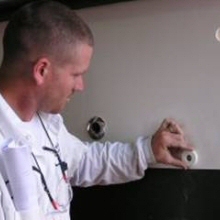 In both parallel and perpendicular connections the cable is rotary swaged onto the fitting using the same technique as is used for standing rigging to give a near-perfect connection. 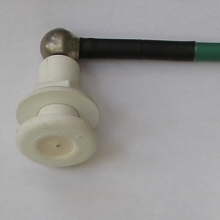 The parallel connection uses a separate connecting fitting, the BallConTM, that is secured to the electrode with a hex screw. This allows for a low-clearance (<3" from outer hull surface) installation when the cable has to run up the hull. 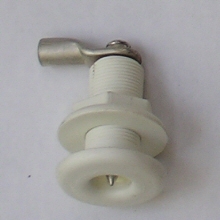 The ball-shaped BallConTM connection also provides a large thermal capacity for heat dissipation. 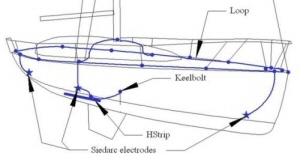 The perpendicular connection is swaged directly onto the electrode before it is embedded in the through hull and so requires more clearance. 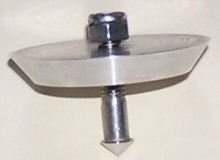 For an 8" radius of curvature, this is about 13", as shown below. If smaller radii of curvature are acceptable, the flexible heat shrink and cable allow for a clearance of about 6-7" from the through-hull head. Three types of through hulls are available, as shown below. The Flush and Mushroom head are Marelon and the Stainless is stainless 316. The vertical dimension shown gives the maximum hull thickness that can be accommodated. 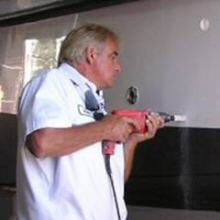 The perpendicular connection is the only one that is available in the Stainless through hull. In the normal configuration there is an air space around the top ~0.5" to allow for cooling. In the faired option additional flame-retardant fairing is added to fill in the cavity and leave only the tip exposed. Since the tip is expected to heat up appreciably during a lightning strike this fairing is likely to blow out to an extent determined by the amount of charge that has flowed, possibly to a depth of 0.5". Thus the appearance of the fairing provides a useful indication of the energy dissipated at that electrode. Since the damage is cosmetic, there is little risk to the integrity of the electrode bedding. After a strike, inspect the fairing to determine the extent of pitting to both the tip and the fairing, clean off all carbon deposits on the electrode with solvent, and refair the damaged portion. 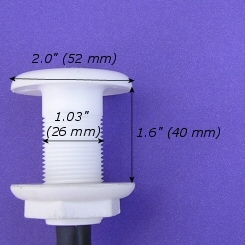 Replace the electrode if the damage extends deeper than 0.5". SiedarcTM electrodes are protected by US patent 6,708,638 and international pending patents. Any use of sparking electrode technology is subject to a licensing fee. Please contact us if you wish to obtain a license. We can arrange very reasonable fees for a single use application.